On the North. From the North point (Fethaland Point) of the Mainland of the Shetland Islands, across to Graveland Ness (60°39'N) in the Island of Yell, through Yell to Gloup Ness (1°04'W) and across to Spoo Ness (60°45'N) in Unst island, through Unst to Herma Ness (60°51'N), on to the SW point of the Rumblings and to Muckle Flugga (60°51′N 0°53′W﻿ / ﻿60.850°N 0.883°W) all these being included in the North Sea area; thence up the meridian of 0°53' West to the parallel of 61°00' North and eastward along this parallel to the coast of Norway, the whole of Viking Bank being thus included in the North Sea. On the East. The Western limit of the Skagerrak [A line joining Hanstholm (57°07′N 8°36′E﻿ / ﻿57.117°N 8.600°E) and the Naze (Lindesnes, 58°N 7°E﻿ / ﻿58°N 7°E)]. The North Sea is important for marine transport and its shipping lanes are among the busiest in the world. Major ports are located along its coasts: Rotterdam, the busiest port in Europe and the fourth busiest port in the world by tonnage as of 2013, Antwerp (was 16th) and Hamburg (was 27th), Bremen/Bremerhaven and Felixstowe, both in the top 30 busiest container seaports, as well as the Port of Bruges-Zeebrugge, Europe's leading ro-ro port. ^ The Walde Lighthouse is 6 km (4 mi) east of Calais (50°59′06″N 1°55′00″E﻿ / ﻿50.98500°N 1.91667°E), and Leathercoat Point is at the north end of St Margaret's Bay, Kent (51°10′00″N 1°24′00″E﻿ / ﻿51.16667°N 1.40000°E). ^ "Centrica seeks consent for 500MW North Sea wind farm". New Energy Focus. 22 December 2008. Retrieved 16 January 2009. Cuxhaven (German pronunciation: [kʊksˈhaːfən]) is an independent town and seat of the Cuxhaven district, in Lower Saxony, Germany. The town includes the northernmost point of Lower Saxony. It is situated on the shore of the North Sea at the mouth of the Elbe River. Cuxhaven has a footprint of 14 kilometres (9 miles) (east–west) by 7 km (4 mi) (north–south). Its town quarters Duhnen, Döse and Sahlenburg are especially popular vacation spots on the North Sea and home to about 52,000 residents. Cuxhaven is home to an important fisherman's wharf and ship registration point for Hamburg as well as the Kiel Canal until 2008. Tourism is also of great importance. The city and its precursor Ritzebüttel belonged to Hamburg from the 13th century until 1937. The island of Neuwerk, a Hamburg dependency, is located just northwest of Cuxhaven in the North Sea. The city's symbol, known as the Kugelbake, is a beacon once used as a lighthouse; the wooden landmark on the mouth of the Elbe marks the boundary between the river and the North Sea and also adorns the city's coat of arms. Dogger Bank (Dutch: Doggersbank, German: Doggerbank, Danish: Doggerbanke) is a large sandbank in a shallow area of the North Sea about 100 kilometres (62 mi) off the east coast of England. 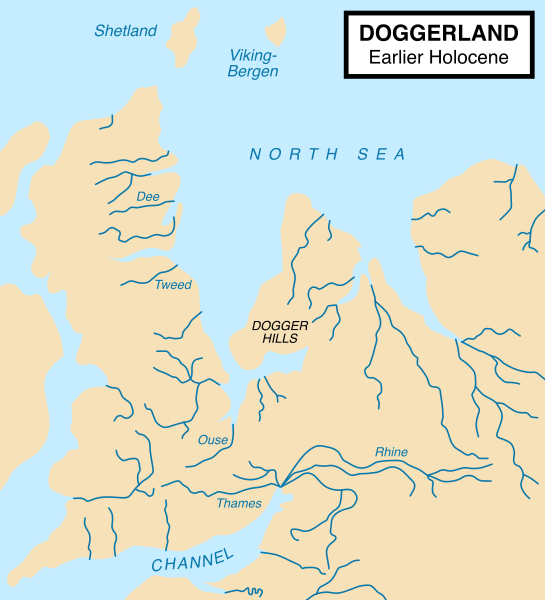 During the last ice age the bank was part of a large landmass connecting Europe and the British Isles, now known as Doggerland. It has long been known by fishermen to be a productive fishing bank; it was named after the doggers, medieval Dutch fishing boats especially used for catching cod. At the beginning of the 21st century the area was identified as a potential site for a UK round 3 wind farm, being developed as Dogger Bank Wind Farm. The Elbe (; Czech: Labe [ˈlabɛ]; German: Elbe [ˈɛlbə]; Low German: Elv, historically in English also Elve) is one of the major rivers of Central Europe. It rises in the Krkonoše Mountains of the northern Czech Republic before traversing much of Bohemia (Czech Republic), then Germany and flowing into the North Sea at Cuxhaven, 110 km (68 mi) northwest of Hamburg. Its total length is 1,094 kilometres (680 mi).The Elbe's major tributaries include the rivers Vltava, Saale, Havel, Mulde, Schwarze Elster, and Ohře.The Elbe river basin, comprising the Elbe and its tributaries, has a catchment area of 148,268 square kilometres (57,247 sq mi), the fourth largest in Europe. The basin spans four countries, with its largest parts in Germany (65.5%) and the Czech Republic (33.7%). Much smaller parts lie in Austria (0.6%) and Poland (0.2%). The basin is inhabited by 24.4 million people. The English Channel (French: la Manche, "The Sleeve"; German: Ärmelkanal, "Sleeve Channel"; Breton: Mor Breizh, "Sea of Brittany"; Cornish: Mor Bretannek, "British Sea"; Dutch: Het Kanaal, "The Channel"), also called simply the Channel, is the body of water that separates Southern England from northern France and links the southern part of the North Sea to the Atlantic Ocean. It is the busiest shipping area in the world.It is about 560 km (350 mi) long and varies in width from 240 km (150 mi) at its widest to 33.3 km (20.7 mi) in the Strait of Dover. It is the smallest of the shallow seas around the continental shelf of Europe, covering an area of some 75,000 km2 (29,000 sq mi). The Firth of Forth (Scottish Gaelic: Linne Foirthe) is the estuary (firth) of several Scottish rivers including the River Forth. It meets the North Sea with Fife on the north coast and Lothian on the south. It was known as Bodotria in Roman times. In the Norse sagas it was known as the Myrkvifiörd. An early Welsh name is Merin Iodeo, or the "Sea of Iudeu". The Humber is a large tidal estuary on the east coast of Northern England. It is formed at Trent Falls, Faxfleet, by the confluence of the tidal rivers Ouse and Trent. From there to the North Sea, it forms part of the boundary between the East Riding of Yorkshire on the north bank and North Lincolnshire on the south bank. Although the Humber is an estuary from the point at which it is formed, many maps show it as the River Humber.Below Trent Falls, the Humber passes the junction with the Market Weighton Canal on the north shore, the confluence of the River Ancholme on the south shore; between North Ferriby and South Ferriby and under the Humber Bridge; between Barton-upon-Humber on the south bank and Kingston upon Hull on the north bank (where the River Hull joins), then meets the North Sea between Cleethorpes on the Lincolnshire side and the long and thin headland of Spurn Head to the north. Ports on the Humber include the Port of Hull, Port of Grimsby, Port of Immingham, as well as lesser ports at New Holland and North Killingholme Haven. The estuary is navigable for the largest of deep-sea vessels. Inland connections for smaller craft are extensive but handle only a quarter of the goods traffic handled in the Thames. The Modern Defense (also known as the Robatsch Defence after Karl Robatsch) is a hypermodern chess opening in which Black allows White to occupy the center with pawns on d4 and e4, then proceeds to attack and undermine this "ideal" center without attempting to occupy it himself. The opening has been most notably used by British grandmasters Nigel Davies and Colin McNab. The Modern Defense is closely related to the Pirc Defence, the primary difference being that in the Modern, Black delays developing his knight to f6. The delay of ...Nf6 attacking White's pawn on e4 gives White the option of blunting the g7-bishop with c2–c3. There are numerous transpositional possibilities between the two openings. The Encyclopaedia of Chess Openings (ECO) classifies the Modern Defense as code B06, while codes B07 to B09 are assigned to the Pirc. The tenth edition of Modern Chess Openings (1965) grouped the Pirc and Robatsch together as the "Pirc–Robatsch Defense". The North Sea Empire, also known as the Anglo-Scandinavian Empire, was the thalassocratic domain ruled by Cnut the Great as King of England, Denmark, Norway and parts of what is now Sweden between 1016 and 1035. North Sea Germanic, also known as Ingvaeonic , is a postulated grouping of the northern West Germanic languages, consisting of Old Frisian, Old English and Old Saxon and their descendants. The North Sea Jazz Festival is an annual festival held each second weekend of July in the Netherlands at the Ahoy venue. It used to be in The Hague but since 2006 it has been held in Rotterdam. This is because the Statenhal where the festival was held before was demolished in 2006. As of 3 November 2017 the festival officially will be known as the NN North Sea Jazz Festival. The North Sea Offshore Grid, officially the North Seas Countries Offshore Grid Initiative (NSCOGI), is a collaboration between EU member-states and Norway to create an integrated offshore energy grid which links wind farms and other renewable energy sources across the northern seas of Europe. It is one of several proposed European super grid schemes. The 1953 North Sea flood was a major flood caused by a heavy storm that occurred on the night of Saturday, 31 January 1953 and morning of Sunday, 1 February 1953. The floods struck the Netherlands, Belgium, England and Scotland. A combination of a high spring tide and a severe European windstorm over the North Sea caused a storm tide; the combination of wind, high tide, and low pressure led to a water level of more than 5.6 metres (18.4 ft) above mean sea level in some locations. The flood and waves overwhelmed sea defences and caused extensive flooding. The Netherlands, a country with 20% of its territory below mean sea level and 50% less than 1 metre (3.3 ft) above sea level and which relies heavily on sea defences, was worst affected, recording 1,836 deaths and widespread property damage. Most of the casualties occurred in the southern province of Zeeland. In England, 307 people were killed in the counties of Lincolnshire, Norfolk, Suffolk and Essex. Nineteen were killed in Scotland. Twenty-eight people were killed in West Flanders, Belgium. In addition, more than 230 deaths occurred on water craft along Northern European coasts as well as on ships in deeper waters of the North Sea. The ferry MV Princess Victoria was lost at sea in the North Channel east of Belfast with 133 fatalities, and many fishing trawlers sank. Realising that such infrequent events could recur, the Netherlands, particularly, and the United Kingdom carried out major studies on strengthening of coastal defences. The Netherlands developed the Delta Works, an extensive system of dams and storm surge barriers. The UK constructed storm surge barriers on the River Thames below London and on the River Hull where it meets the Humber Estuary. North Sea oil is a mixture of hydrocarbons, comprising liquid petroleum and natural gas, produced from petroleum reservoirs beneath the North Sea. In the petroleum industry, the term "North Sea" often includes areas such as the Norwegian Sea and the area known as "West of Shetland", "the Atlantic Frontier" or "the Atlantic Margin" that is not geographically part of the North Sea. Brent crude is still used today as a standard benchmark for pricing oil, although the contract now refers to a blend of oils from fields in the northern North Sea. Northwestern Europe, or Northwest Europe, is a loosely defined region of Europe, overlapping northern and western Europe. The region can be defined both geographically and ethnographically. The Rhine (Latin: Rhenus, Romansh: Rein, German: Rhein, French: le Rhin, Italian: Reno, Dutch: Rijn) is one of the major European rivers, which has its sources in Switzerland and flows in an mostly northerly direction through Germany and The Netherlands to the North Sea. The river begins in the Swiss canton of Graubünden in the southeastern Swiss Alps, forms part of the Swiss-Liechtenstein, Swiss-Austrian, Swiss-German and then the Franco-German border, then flows through the German Rhineland and the Netherlands and eventually empties into the North Sea. The largest city on the Rhine is Cologne, Germany, with a population of more than 1,050,000 people. It is the second-longest river in Central and Western Europe (after the Danube), at about 1,230 km (760 mi), with an average discharge of about 2,900 m3/s (100,000 cu ft/s). The Rhine and the Danube formed most of the northern inland frontier of the Roman Empire and, since those days, the Rhine has been a vital and navigable waterway carrying trade and goods deep inland. Its importance as a waterway in the Holy Roman Empire is supported by the many castles and fortifications built along it. In the modern era, it has become a symbol of German nationalism. Among the biggest and most important cities on the Rhine are Cologne, Düsseldorf (Germany), Rotterdam (Netherlands), Strasbourg (France) and Basel (Switzerland). The Teutons (Latin: Teutones, Teutoni, Greek: "Τεύτονες") were an ancient tribe mentioned by Roman authors. They are generally classified as a Germanic tribe. The Teutons are best known for their participation in the Cimbrian War with the Roman Republic in the late 2nd century BC. The Wadden Sea (Dutch: Waddenzee, German: Wattenmeer, Low German: Wattensee or Waddenzee, Danish: Vadehavet, West Frisian: Waadsee, North Frisian: di Heef) is an intertidal zone in the southeastern part of the North Sea. It lies between the coast of northwestern continental Europe and the range of low-lying Frisian Islands, forming a shallow body of water with tidal flats and wetlands. It has a high biological diversity and is an important area for both breeding and migrating birds. In 2009, the Dutch and German parts of the Wadden Sea were inscribed on UNESCO's World Heritage List and the Danish part was added in June 2014.The Wadden Sea stretches from Den Helder, in the northwest of the Netherlands, past the great river estuaries of Germany to its northern boundary at Skallingen in Denmark along a total coastline of some 500 km (310 mi) and a total area of about 10,000 km2 (3,900 sq mi). Within the Netherlands it is bounded from the IJsselmeer by the Afsluitdijk. The Wadden Sea's coastline has been heavily modified by man. Extensive systems of dikes and causeways make it among the most human-altered on the planet. The Weser (German pronunciation: [ˈveːzɐ]) is a river in Northwestern Germany. Formed at Hannoversch Münden by the confluence of the rivers Fulda and Werra, it flows through Lower Saxony, then reaching the Hanseatic city of Bremen, before emptying 50 km (31 mi) further north at Bremerhaven into the North Sea. On the opposite (west) bank is the town of Nordenham at the foot of the Butjadingen Peninsula; thus, the mouth of the river is in Lower Saxony. The Weser has an overall length of 452 km (281 mi). Together with its Werra tributary, which originates in Thuringia, its length is 744 km (462 mi). Wilhelmshaven (German: [vɪlhɛlmsˈhaːfn̩], lit. William's Harbour) is a coastal town in Lower Saxony, Germany. It is situated on the western side of the Jade Bight, a bay of the North Sea. Wilhelmshaven is the centre of the "JadeBay" business region (which has around 330,000 inhabitants). The adjacent Lower Saxony Wadden Sea National Park (part of the Wattenmeer UNESCO World Natural Heritage Site) provides the basis for the major tourism industry in the region.